This “cat’s claw” geometric twist blanket from Esme Crick combines retro colours and a ripple pattern to make this throw a total vintage-meets-modern aff air! Find this project in issue 106 of Inside Crochet magazine, available to order online and download in a couple of clicks. 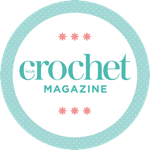 Esme from Red Sparrow Crochet has been designing since she was a girl, and is now a crochet addict, teacher, mum and music obsessive. Follow her crochet musings (and meet Hank Deluxe her helpful cat) at www.redsparrowcrochet.blogspot.co.uk.